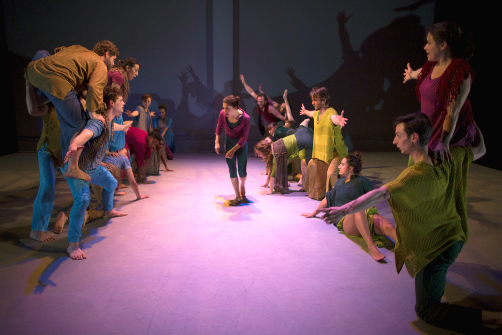 Marisol Kimberly Rosa-Shapiro and company in Babel. Photo by Lloyd Mulvey. BOTTOM LINE: A physical spectacle that reinvents one of the oldest stories in the world, Babel calls upon diverse perspectives to reveal ambition, grief, and healing within the complexity of the human condition. The story of the Tower of Babel does not take up much space in the Bible, so it's a big feat to expand this tale to an alluring, 75-minute show that’s constantly dynamic. In WT McRae and Jeremy Williams’ version, the Tower of Babel is a cyclical tale. The people recognize the power of collaboration and build the tower that could impress even the gods. However, their accomplishment threatens the high power: the tower crumbles and the people are divided. In a vulnerable and haunting moment, individuals who used to work in perfect harmony hold on to their last attempts to connect, yet are driven apart by the fear of differences. First it is the charged stillness: you feel like you’ve just walked into a sculpture garden, where twelve duos connect with each other through various configurations. They study and interpret each other, explore each other’s limits, imitate each other, or put each other into various positions, with a sort of innocent awe on their faces. Julie Zhu and Robert Fleitz’s music has a distinct quality that urges the audiences to be aware of the nuances on stage, never going melodic for too long so that you’d feel content to just take in the motions, but rather, to dig deep into the philosophy of the actions that are unfolding before you. After the tower crumbles, the recovery starts in darkness. The process is gradual. New partnerships are formed as people find others who share their languages. It’s a small miracle to find connection amidst isolation; the sentiment is described poignantly through the ensemble’s choreography. Each of the new “tribes” finds their own distinct identity: some move in fluid symmetry; some are whimsical, robust, or smooth like jazz; some support each other with cautionary, reverent elegance; some glide across the stage as sensual as honey; some stumble like a three-wheeled wagon. Going through the entire ensemble and creating a partner identity for all twelve duos makes this section seem a bit long. But what they all share is the exhilaration of finding a sense of partnership, a sense of belonging. The "tribes" soon converge. Smaller groups encounter one another, and after the initial shock one would experience upon first meeting a stranger, they search for elements that connect, and consequently form larger "tribes." It’s demonstrative of the evolution of language and culture. Ultimately, two "superpowers" are formed. When they finally face each other, the pride that exists within either side—which very much resembles nationalism—makes it too difficult for them to bond. The characters become fixated on their differences. It hits even harder when members of warring sides were originally partners in perfect harmony. Aggression bursts out of prejudice and arrogant ignorance. It’s noteworthy to mention that throughout the entirety of the piece, Jay Ryan’s lighting consistently impresses and enhances the dynamics on stage, and during the portrayal of "war" his design makes the frigidity and darkness visible, adding a touch of menace to the inevitable conflict. But the piece ends on a note of optimism. The conflicts simmer down and the people recognize the extent of hurt brought on by stupidity. They gather once more and the tower of Babel is erected once again. Babel is above all a fable. Blossoming from a peculiar and altogether enigmatic story, it is Convergences Collective’s earnest effort to demonstrate the strength and perseverance of the human spirit. We live in a time of turbulence. All too often it would seem that power is held by those who try to divide, instill hatred, and distinguish themselves at the expense of other, less privileged people. A wall is a fragile thing. It is easily compromised: sometimes all it takes is a rose, a wash of moonlight, a word of understanding. Babel is a message of empowerment, and a reassurance that the desire to connect, collaborate, and find common ground is, and will always be, humanity’s perpetual ambition. It reminds us that those who find strength in their communities will have the perseverance of Sisyphus to carry on despite any adversity. Babel is by WT McRae and Jeremy Williams. Directed by Jeremy Williams. Music is by Julie Zhu and Robert Fleitz. Costume design is by Natalie Loveland. Lighting design is by Jay Ryan. The cast includes Leo Abel, Argelia Arreola, Casey Beauchamp, Bruce Wayne Brackett, Tad Emptage, Melissa Denize, Olney Edmondson, Michael Eisenstein, Mark Ferrando, Brooke Ferris, Nora Gustuson, Jenna Hokanson, Sydney Ippolito, Eiko Kawashima, Charlie Kilgore, Zachary Koval, Ana Carolina Lima, Erica Lindegren, Melana Lloyd, Devin McDuffee, Rafa Reyes, Marisol Kimberly Rosa-Shapiro, Liz Stanton, and Juliana Suaide.